It started out as a 4 track EP-isode and has finally grown into a fully-fledged album. 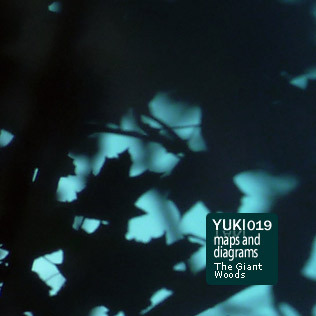 Maps And Diagrams' latest strike on classical electronica is also his first release on Yuki Yaki, which marks a little beatless respite after a number of more rhythmic outputs recently. Warmly droning ambient-textures with plenty of endless space echo, like in the good old days, dominate the album. Melancholy, contemplation and calm prevail - nicely wrapped in mysteriously shining soundscapes with a kiss of lo-fi noise. "The Giant Woods" seems to be rather predestined for the dark Winter days to come. The cover is part of the Tim Martin ShowCase on Yuki Yaki. "maps and diagrams" is well known in the world of electronic music. He releases on several labels such as Static Caravan, Expanding Records and Smallfish. In addition to that, he collaborated with many other labels, released tracks on compilations and did remixes. Apart from releasing music, he also co-runs Cactus Island Recordings with Steve Broca.